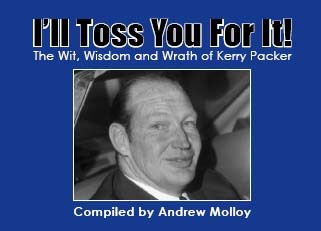 About the author, Andrew Molloy, of the latest Kerry Packer book - "I'll Toss You For It!". He holds a Master of Business Administration, Master of Arts, Bachelor of Arts and a Graduate Diploma of Education. Andrew’s great passion besides Business is History. His other works include a number of local histories. In March 2004, Andrew Molloy was described in the New South Wales Parliament as “...a great historian”. Andrew is a very distant relative of Kerry Packer through the Hordern family.